Today, the Space Foundation family joins with the rest of America and the world in remembering and honoring the life and legacy of President George H. W. Bush, 41st President of the United States. 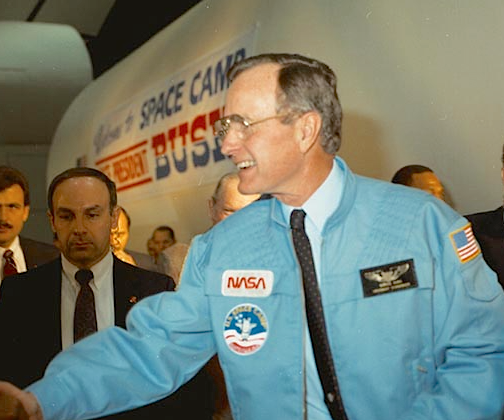 Tom Zelibor, CEO of the Space Foundation reflected, “While much of his legacy is for his leadership in ushering in the post-Cold War era, President Bush was also an extraordinary point of light for many in the space community. His support for America’s return to flight after the loss of Challenger; restart of the National Space Council; advocacy for early commercial space pioneers; push for the STEM education mission with educators and the Challenger crew families; and pioneering new efforts to explore the Moon, Mars and universe around us, are all legacies that are shaping today’s space renaissance.